Pisces is a dreamer. They enjoy illusion, fantasy, and art. Pisces is a hopeless romantic – sentimental and in love with the idea of love. Pisces can be quite naive, making it easy to take advantage of them. Their emotionally insecurity can cause bouts of jealousy. Pisces needs constant reassurance that they are safe and secure. Pisces loves anything that brings out their creative side. A gift that appeals to Pisces' romantic nature is a sure hit. So too anything related to history, art, jewelry, or animals. When choosing a gift for Pisces, consider their love of water, children, nature, and beauty. Pisces is quite sensual with a love for fine food and comfort. 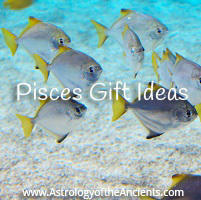 If you are still unsure what gift to choose for your Pisces, here are some specific gift ideas. Just make sure to tailor them to the interests and personality of your particular Pisces. Pisces is sentimental at heart, with a love of a family. A lovely family photo or a scrapbook of a favorite trip are great ways to help them remember good times. Pisces is a water sign, making any water related gift a success. Book a cruise, get tickets to an aquarium, sign your Pisces up for scuba lessons…pamper them with bath salts or buy them a soothing fountain for their office. Pisces loves music. Concert tickets, an mp3 player, or a gift certificate to let them buy their favorite songs are sure to delight. You could also tap into their creative side with a lovely piece of art or some supplies so they can make their own. Pisces rules the feet so a gift of comfortable slippers is sure to please. A gift certificate for a foot massage or pedicure is also a nice treat. Play into Pisces sensual nature with a luxurious bathrobe, a warm blanket, or a wine tasting. Even a chocolate-of-the-month club would be welcome. Jewelry appeals to Pisces' love of beauty and romance. Your Pisces probably has a favorite gem so be sure to choose it. But if you're still uncertain, amethysts and aquamarines are usually a favorite Pisces gift. I hope you enjoyed this guide to Pisces gift ideas as much as I enjoyed writing it!